KUALA LUMPUR: The SME Association hopes the government will look into the rehiring programme for foreign workers without permits by simplifying it to help the small and medium enterprises (SMEs). SME Association of Malaysia national president, Michael Kang Hua Keong, said the move will reduce the cost for SMEs. "I hope the government will work closely with the business associations and local chambers of commerce to legalise all the illegal workers to help SMEs grow their businesses," he said at the association's Chinese New Year gathering recently. Also present was Minister in the Prime Minister's Department, Datuk Dr Wee Ka Siong. 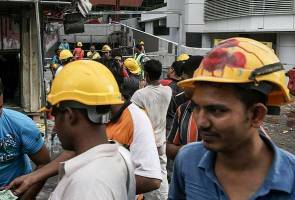 The rehiring programme, which was unveiled on Feb 15, aims to give an opportunity to illegal foreign workers in Malaysia to apply for valid work permits to meet labour demand in specific sectors after tight screening. It is learnt that the rehiring programme will carry on for the undocumented immigrants from the existing 15 countries of origin and no actions will be taken against compliant employers and workers. Kang said 2016 will be challenging year for the SMEs as the global economy was facing strong headwinds and the SMEs should be prepared for this. He said with the full implementation of the Trans-Pacific Partnership Agreement there will be intense competition and SMEs should buck up to compete internationally.